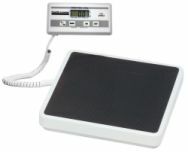 The Health O Meter remote display digital physician scale is a great low cost and portable patient weight scale. Optional carrying case is available. This scale can interface with the Welch Allen Spot Vital Signs monitor.